Not too long ago, it was rumored that the much awaited Instagram for Windows Phone 8 operating system will rollout in a week. It seems the rumor was correct as the official Instagram app is now available in Windows Phone Store. The application is still in beta stages so it might contain a few bugs. There are a few decent third-party Instagram applications available in the Windows Phone Store, but having an official is always a plus. The Windows Phone version comes with all the core Instagram features and photo filters that are found on iOS and Android, but still lacks some features that are present in the Instagram app on other platforms. Unfortunately, the application doesn’t support video recording. There are more missing features as well such as the inability to tag people in photos etc., but the Instagram team mentioned they’re not finished yet and will release more features in the future. Overall, the application brings a very decent interface that goes with the Windows Phone operating system. It seems that Nokia’s efforts were fruitful after all as they announced about the availability of Instagram on Microsoft’s OS. Just head over to the Windows Phone Store and install the official Instagram app on your Windows Phone handsets. 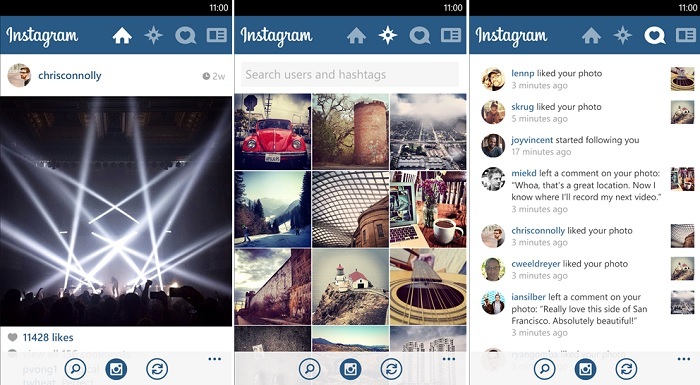 Feel free to share you view with us if you used Instagram on your Windows Phone handsets.